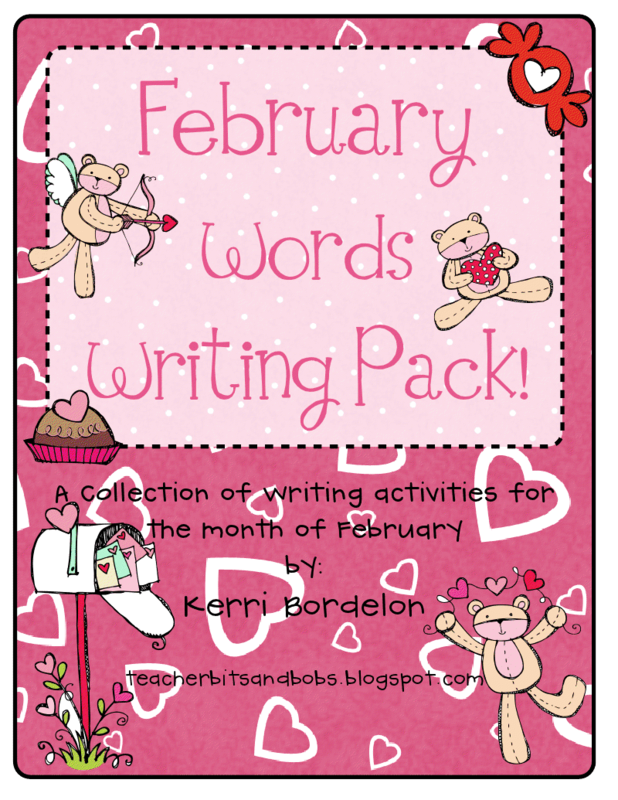 Teacher Bits and Bobs: February Words are Up and Running!! February Words are Up and Running!! 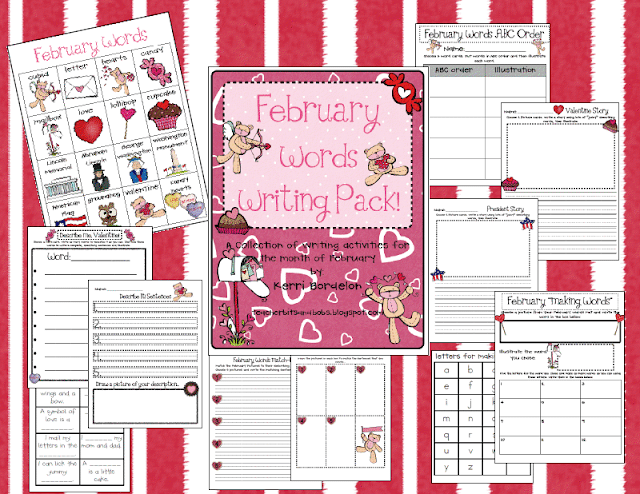 Use this writing activity in your writing center for the whole month and allow the kids to write describing sentences about each February word, one word per page. Cut apart laminated February Words mats to make individual cards. Students choose 5 words, place in ABC order, and illustrate! Use individual cut up February Word cards. Students choose 2-3 cards and write a story using lots of describing words, and then illustrate their story in the box. Students choose a picture from the February Words Mat, write it in the box, and illustrate it. Next, they find the letters to spell the word. (Letters included in packet-copy and laminate as many sets as you need for students to use). Students will make as many words as they can using the letters from the February word that they chose and write in the boxes. February Words “Describe Me!”- NEW ACTIVITY! Students will choose a card and write down a list of as many words as they can think of to describe it. Then, they will use those words and write “I have... or I am...” sentences, such as “I am red and pink.” on the back of the Describe Me! worksheet and illustrate the word they chose in the box provided. Students will match up each Cut-up February word card to the laminated sentence card that describes it. After matching, students will choose 5 pictures, write the corresponding sentence on the lines, and illustrate the pictures on the back. Yikes! Can you believe February will be here next week?? I hope you all know how blessed I feel every time you purchase one of my products, leave a sweet comment, or even just stalk my page (you stalkers, you!!) You all continue to renew my passion for teaching, and I am so grateful to be a part of the blogging community! Have a great night, friends!! P.S. The first person to leave me a comment with an email, telling me your favorite Valentine Candy OR your favorite President of ALL TIME will get this little pack for F.R.E.E!! That's right, sistas!! Hope I win! Love Reese's Peanut Butter Cups! Love chocolate with caramel inside!! You continue to amaze and inspire me with all your creativity! You are the best! Very cute! I wish you sold your word lists separately though because the writing activities are too hard for my babies, but I would love to have the word lists at their tables as a resource for writing. This packet looks great! Thanks for sharing the details! Love! Super cute!! But I have to say, you really freaked me out, talking about how February is NEXT week! AH! My favorite candy would have to be Reese's! There is just something about peanut butter and chocolate... sigh. You're too cute. Love it. All. On my wish list. I love these, I wait for them to come out each month/season! can't wait to get this one ready for next week! I wonder if you would ever consider just selling the word chart for say, $1.00? Or else all the words charts for each month as one big pack. As much as I think your accompanying worksheets are cute, I'd rather just use the word chart for read the room and stuff. A Hodge Podge of stuff, plus another FREEBIE!! Got inked...and a TARGET find! Winter Games FREEBIE and Snowman ART! Kindergarten & First Grade Fever!